Our Christian apparel shop is always stocked with the latest styles. Whether you’re shopping for cool Christian apparel or something with a more traditional tone, we’re confident you’ll find exactly what you need right here. If you’re hesitant to wear religious clothing because everything you’ve seen is either a bit too deep or far too cheesy for your liking, you clearly haven’t browsed our Christian apparel shop. Unlike some Christian apparel companies, we make it our goal to offer hip and trendy clothing that’s just as stylish as it is meaningful. 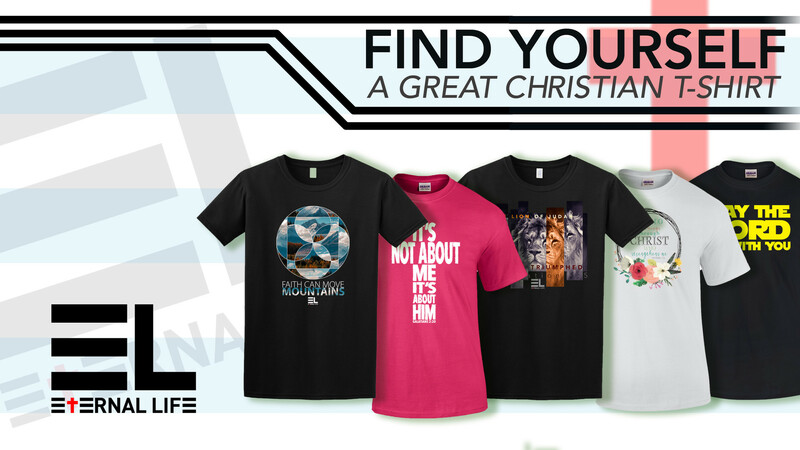 Our cool Christian apparel is up-to-date with the latest styles, because incorporating your faith into your wardrobe should be just as easy as accepting God into your life. As a stylish person, you know how difficult it can be to find chic religious attire, but we’ve solved that problem for you. Our Christian apparel shop is always filled with on-trend merchandise designed to help you make Him a wardrobe staple, without having to sacrifice an ounce of style. More so than other items in your closet, religious clothing represents your true self. Use our Christian apparel shop to find pieces that make it easier than ever to tell your story. The clothes you put on each day are a direct reflection of your personality. When shopping, you have millions of choices at your disposal, so be sure to incorporate a few pieces of Christian clothing that clearly represent your faith. No matter what your style, we have more than a few items that will perfectly integrate with your wardrobe. If you're looking for Men's Christian T-shirts, we've got just the thing for you. As a devout Christian, you firmly believe that everything in life is a result of His doing. No matter where you are, at any time of day, you can feel His reassuring presence with you — and that is truly amazing. Rejoice in the incredible power of Christ by wearing Christian clothing that celebrates your Savior. Our Women's Christian Shirts are designed to encourage you and share your faith with others. When you’re really proud of something, it’s only natural to want to share it with everyone and this is an easy way to do just that. There’s no one way to worship God, so it’s important to build your own connection to Him. Christian clothing is a great way for people of all ages to show their deep-rooted faith with pride. Whether you’re shopping for new additions of Christian Kids T-shirts to your children’s closets or your own, we’re pleased to offer hundreds of items to choose from. Unite your entire family by choosing the same t-shirt style for everyone or keep browsing until you find something to fit each person’s unique personality — the choice is yours. We’re pleased to carry many top Christian clothing lines, including Cherished Girl and Not of This World. As one of the leading Christian clothing stores, we’re committed to providing you with the latest styles from your favorite brands. Finding your personal style isn’t always easy, so it’s important to where to go when you want to stock up on Christian apparel from companies you already know and trust. Unlike some Christian clothing stores, we carry a wide-variety of brands to make your shopping experience as seamless as possible. When browsing our site, you’ll find many leading Christian clothing lines, as well as apparel from independent labels. This allows you to mix-and-match to create a style that is truly your own. We’re also pleased to offer competitive pricing, fast shipping and a variety of payment methods for your convenience. We strive to offer the very best collection of Christian clothing you’ll ever find. It’s our goal to be your one-stop destination for everything from adorable infant onesies to adult apparel containing powerful religious messages. Our inventory is frequently updated to ensure you’ll always find something new on each visit. Enjoy everything our extensive collection has to offer, whether you’re looking for new additions from your favorite Christian clothing lines or simply want to browse until you find something with a message that calls out to you.